Conflict is a hallmark of neurosis, but conflict is not invariably neurotic. Some degree of conflict is even desirable since without some tension between opposites the developmental process is inhibited. Conflict only becomes neurotic when it interferes with the normal functioning of consciousness. When a conflict is unconscious, tension manifests as physical symptoms, particularly in the stomach, the back and the neck. Conscious conflict is experienced as moral or ethical tension. Serious conflicts, especially those involving love or duty, generally involve a disparity between the functions of thinking and feeling. If one or the other is not a conscious participant in the conflict, it needs to be introduced. 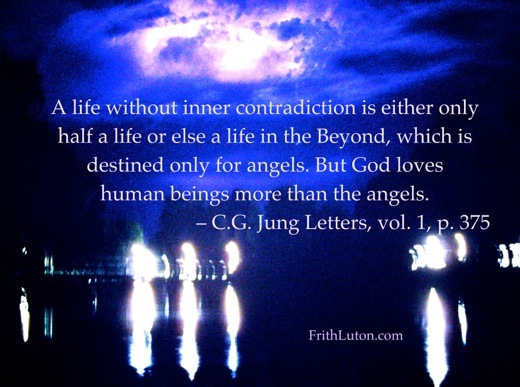 Jung’s major contribution to the psychology of conflict was his belief that it had a purpose in terms of the self-regulation of the psyche. If the tension between the opposites can be held in consciousness, then something will happen internally to resolve the conflict. The solution, essentially irrational and unforeseeable, generally appears as a new attitude toward oneself and the outer situation, together with a sense of peace; energy previously locked up in indecision is released and the progression of libido becomes possible. Jung called this the tertium non datur or transcendent function, because what happens transcends the opposites. Holding the tension between opposites requires patience and a strong ego, otherwise a decision will be made out of desperation. Then the opposite will be constellated even more strongly and the conflict will continue with renewed force. Jung’s basic hypothesis in working with neurotic conflict was that separate personalities in oneself – complexes – were involved. As long as these are not made conscious they are acted out externally, through projection. Conflicts with other people are thus essentially externalizations of an unconscious conflict within oneself.